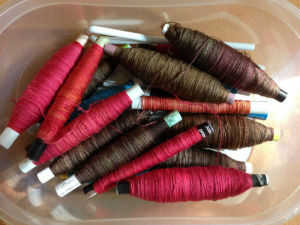 I’ve been spinning bombyx silk on my Golding spindles on and off for quite a while now. It’s been my go-to spinning project these days. 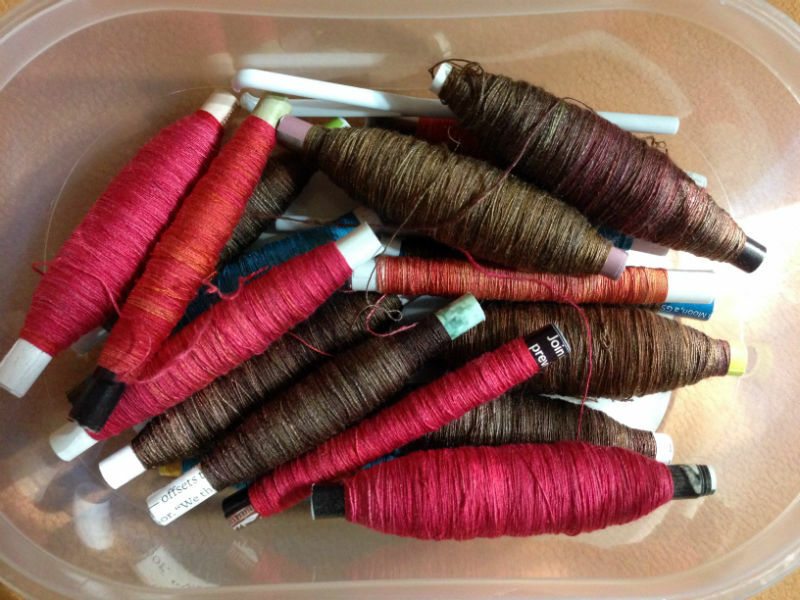 In the past year, I’ve acquired quite a stash of dyed bombyx roving. I have no idea what I will do with the end result since I have way more than I need to weave a band or two or even ten. I have a small collection of spun bombyx singles waiting to be plied. But as with all things, my attention wandered. I started to think about the Eri Batts that I purchased a few SOARs back (2011 and 2013). And then I had to spin some right now. So I went stash diving and pulled some eri batts out of stash. The staple is really short (by silk standards) — anywhere from 6-9″ long because these are made from cocoons where the silk moths have hatched. There are also some really short bits in there that create little slubs. I’ve pulled some out; some I’ve left in for visual interest. Eri in batt form has a sheen that is similar to bombyx but with a honeyed hue. When spun, I think it has the feel and texture that is more like tussah. The singles do not have the same shine as bombyx — it looks more like tussah in that respect. I definitely cannot spin it as fine as the bombyx, but it’s definitely faster! The eri (below center) was spun in about an hour or so. The bombyx (below right) was spun over the course of a couple of evenings while watching mindless television. 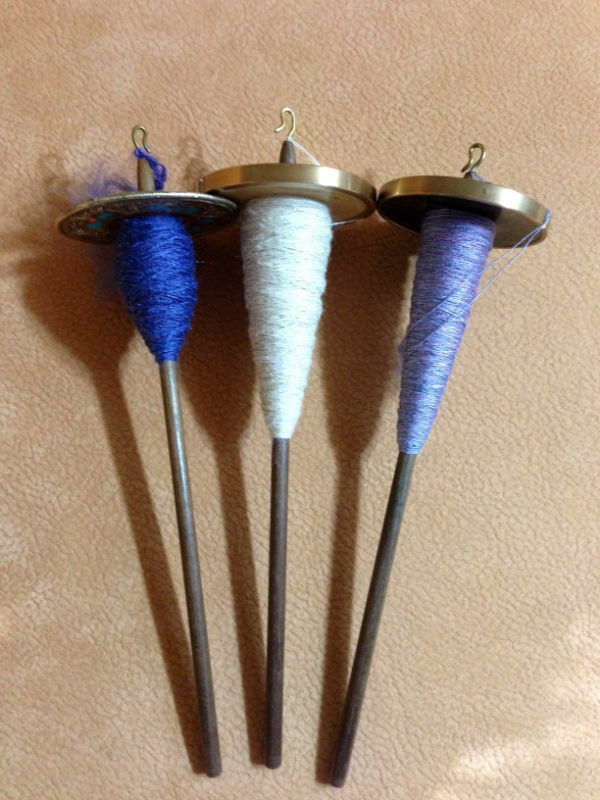 In the picture on the left, from left to right: tussah (blue-purple), eri (natural), and bombyx (light blue). All on Golding spindles. It’s been fun spinning the eri from the “cloud.” I don’t know how else to describe it. You can’t strip it like you would normally strip a batt. There are definite bands of silk with breaks along fiber length. The “waves” you see in the batts cannot be flattened without pulling the fiber apart. So I’m just pulling them out in small bundles, fold them over and spin more or less from the fold. 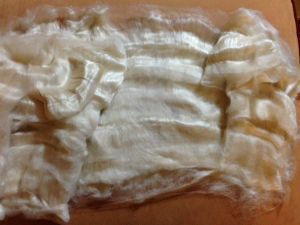 Unlike silk bricks, the fiber length runs along the short way of the batt. I think it would be too fragile to dye in this form. If I were to dye it, I would do it after spinning and plying. I haven’t decided whether I will dye it or not. I was thinking of leaving it natural with bands of red eri to create stripes.